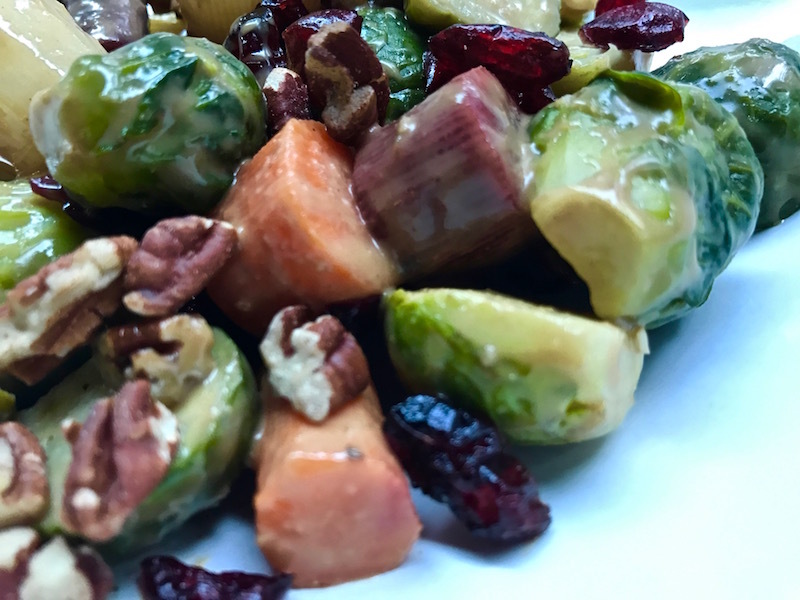 Steamed Dijon Brussels Sprouts and Carrots | Keep It Up, David! I have plenty to share about my wonderful Thanksgiving (I hope you had a great turkey day as well! 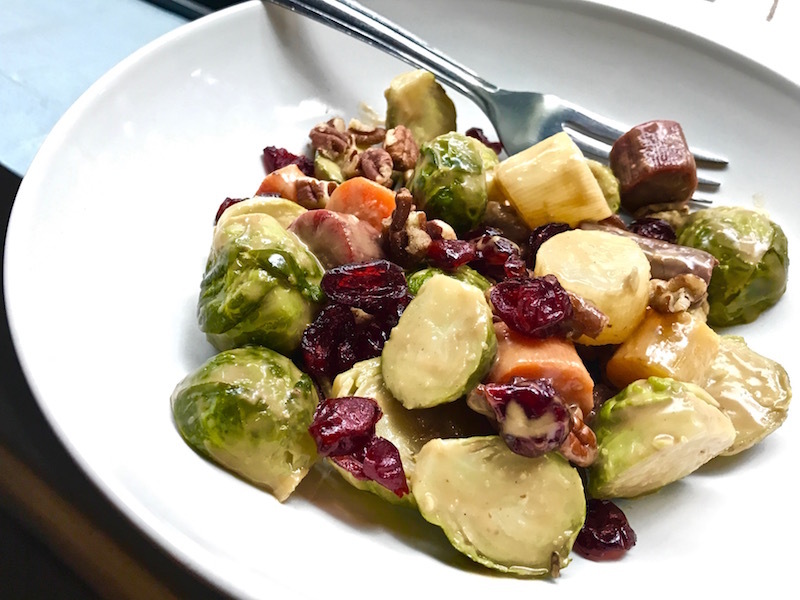 ), but, in my last post, I promised to share the fate of some Brussels sprouts, so I’m gonna deliver on that promise, and write about Thanksgiving next time. 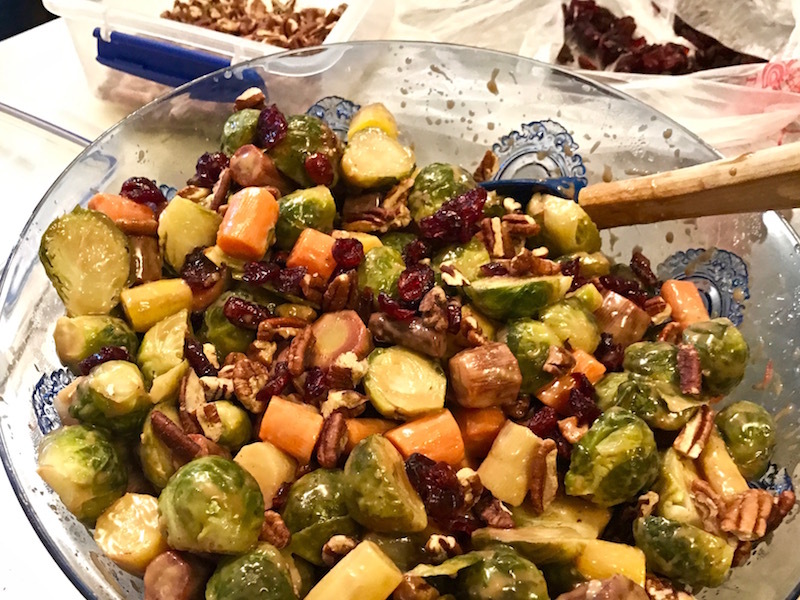 I paired these Brussels sprouts with carrots and created a wonderful side dish that I brought to a potluck last week. It was a Thanksgiving-themed potluck, and this dish is a great Thanksgiving side, but it’d also be great throughout all of autumn, or, let’s face it, any time of year. Another reason I love this recipe is that it can be served warm or cold, so you can make it ahead, or serve it soon as it’s finished. I brought it to the potluck cold. That was easiest – I had a 35-minute drive anyway. 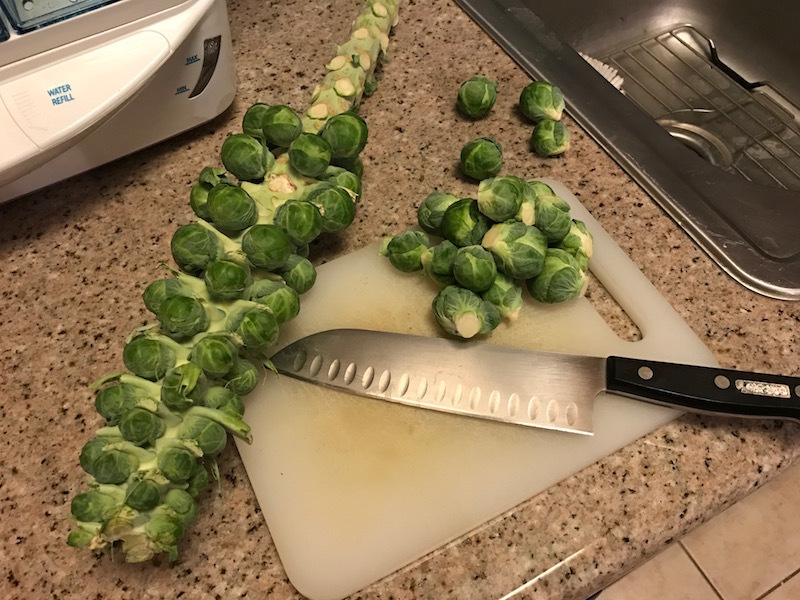 The Brussels sprouts stalk from my last post yielded one pound of Brussels sprouts. I added another 1-pound bag, totally 2 pounds of Brussels sprouts. I halved most of them, quartered the largest ones, and kept the tiny ones intact. Basically, I wanted them roughly the same size for consistent cooking. 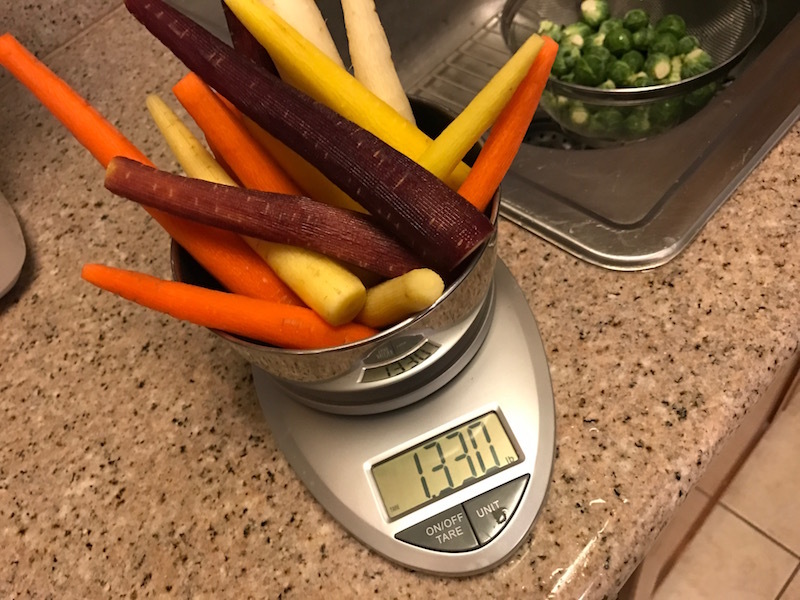 Then, I prepped 1 and 1/3 pound of rainbow carrots. When I first started writing about rainbow carrots years ago, they were pretty rare, but lately, I’ve been seeing them everywhere, and I love it. You can use regular carrots too. 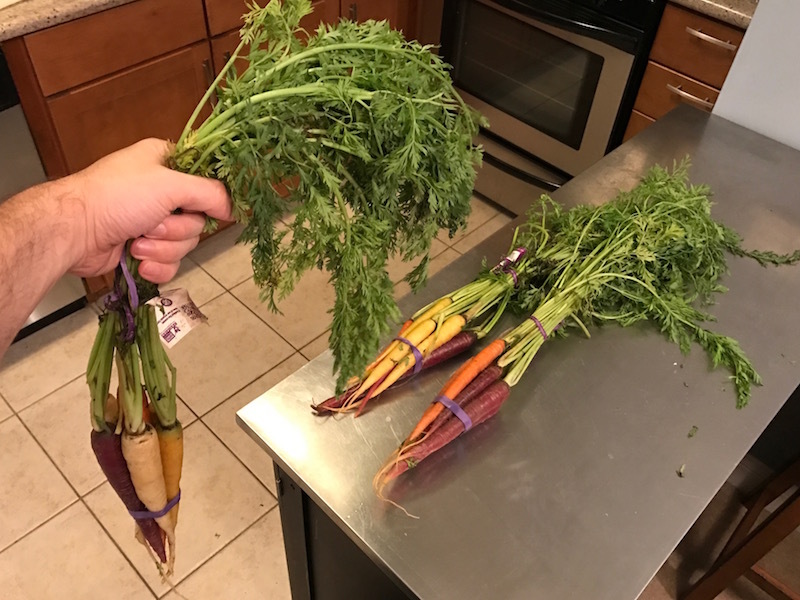 My rainbow carrots came with the greens intact. And there were a LOT of greens. Enough to make a wig! I washed and peeled the carrots, and then cut them into uniformly-sized pieces. 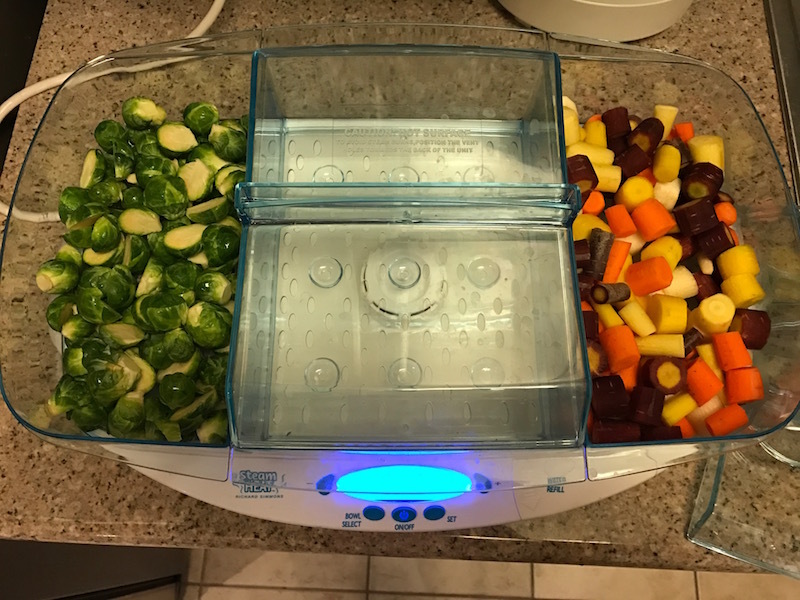 The Brussels sprouts and carrots went into my Richard Simmons Steam Heat electronic steamer, and it all took 20 minutes to cook. (I did the Brussels sprouts in 2 batches.) You can steam them on your stove too, no problemo. I kept busy while they were cooking. I toasted some pecan pieces. 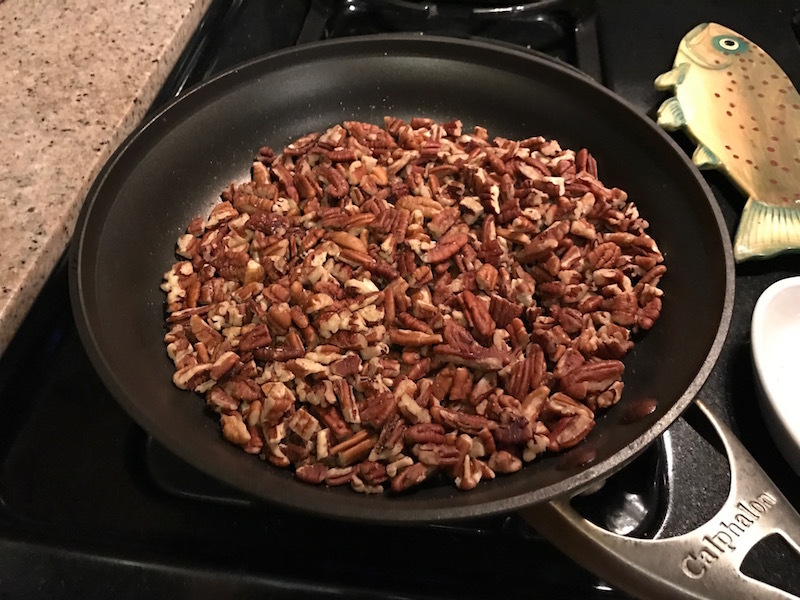 You need 1 cup of toasted pecan pieces for this recipe, but I toasted 2 cups so I had extras for other things. Toasting nuts is easy: just put the raw nuts (pecans, walnuts, almonds, whatever!) in a nonstick skillet. There’s no need for oil, spray or butter. Then turn on medium-low heat, and let them sit for a few minutes until you can smell them. That’s it; they’re toasted! 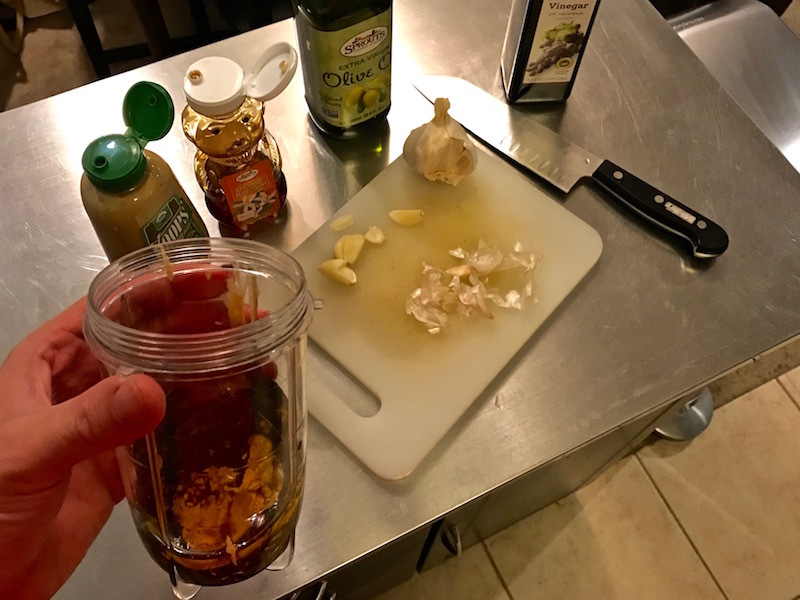 RELATED CONTENT: Check Out Tons of Healthy Recipes on My Recipes Page! You want to blend it all together, so you can toss it in a blender or food processor, but I used my Magic Bullet. 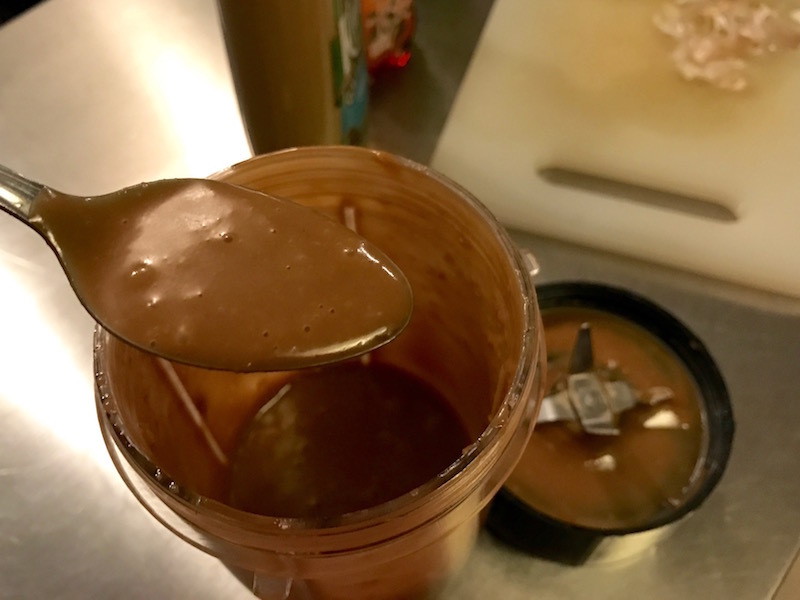 It only took a few seconds to make a smooth, delicious dressing! Confession: I did everything so far the night before, and popped the veggies and dressing in the fridge. Then, the day of the potluck, all I had to do was assemble it! The Brussels sprouts and carrots went in a big bowl. Then, I added 3/4 cup of the pecans, and 1 cup dried cranberries. Then, I added the dressing, tossed it all together, and sprinkled the final 1/4 cup pecans on top, as a pretty garnish. Steaming the veggies made them tender and bright, and the pecans and cranberries added crunch and a bit of sweetness, respectively. 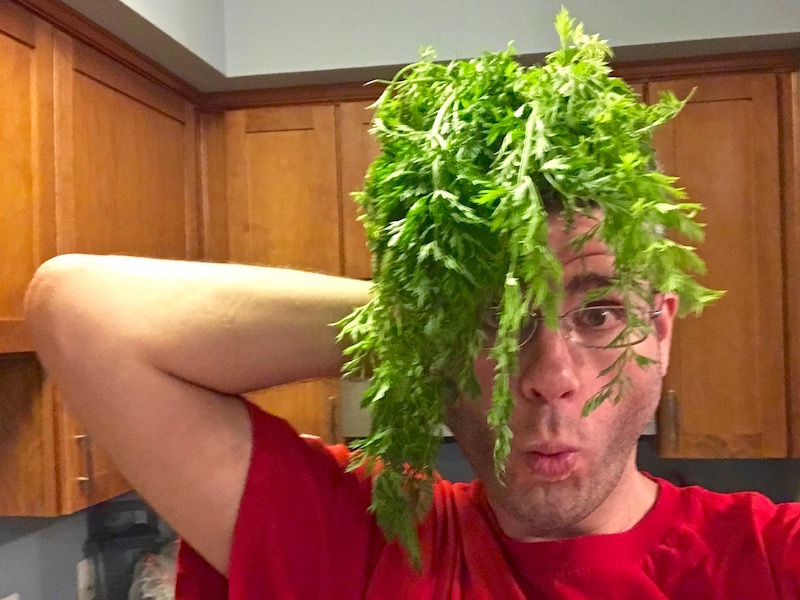 It was fantastic… and a hit at the potluck! (The bowl in the above picture has about 1.5 servings.) A lot of those calories came from the pecans, cranberries, and olive oil, and you can easily reduce or eliminate one of them, or all three! Bookmark this recipe for Thanksgiving 2017! This entry was posted on Friday, November 25th, 2016 at 3:44 pm and is filed under Uncategorized. You can follow any responses to this entry through the RSS 2.0 feed. You can leave a response, or trackback from your own site. Im pretty sure I’m in love with you……..
And I’m in love with you. Thanks!